Nikon has always been a big name in cameras and optical equipment, and their products usually fare excellently in magazine reviews. But let’s face it, Nikon never quite cracked the highest echelon of the birding binoculars market—a group that includes such optical equipment stalwarts as Leica, Swarovski, and Zeiss. Until now, that is. With the EDG line (pronounced “edge”) Nikon has signaled its intent to grab the top end of the birding optics market. And judging from the 10×42 EDG binos I tested, they are well on their way. And Nikon went about their quest for this lucrative niche market in the right way—enlisting help from top birders to design binoculars that are comfortable to hold and look through for hours at a time; optically superb with a crisp, bright image from edge to edge and no color shifts or fringing; quick and easy to focus; lightweight yet rugged; and, of course, waterproof. The EDGs are available in three 42mm models (7×42, 8×42, 10×42) and two 32mm models (8×32 and 10×32). I had an opportunity to try out the 10x42s last year when they were still in the development stage. 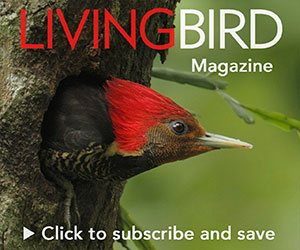 I went on a trip with several other birding writers and editors to the bird-rich hinterlands of Guatemala. One thing I could definitely attest at the end of my journey is that these binoculars are waterproof. Of course, Nikon brags about the rubber O-rings used in the construction and the nitrogen gas sealed in the binoculars’ barrels, which the company claims will keep water out even if they’re 16 feet under water. But the binoculars really got put through the acid test in Guatemala. One day walking in the mountains, the skies opened up in a torrential downpour that quickly turned the steep, rocky trail into an ankle-deep river. Everything I had was completely inundated with water—even my supposedly waterproof jacket. But the EDG binos came through perfectly, with no fogging whatsoever. I just wiped off the water at the end of the rainstorm, and they were ready to go. The only thing that fogged up was my eyeglasses. EDG binoculars have a magnesium alloy body for lightness and durability, with a soft rubber coating in the areas where your hands make contact, and indentations in the bottom of the barrels to accommodate your thumbs, both of which add to the comfortable feel of the binoculars. The EDG in the name refers to the “extra-low dispersion glass” the lenses are made of, which has been a hallmark of the company’s top-of-the-line camera lenses for years, boosting clarity and brightness and eliminating color fringing. As for the general specs, the 10×42 model weighs in at 28.9 ounces, not counting the strap—not the lightest binoculars in their class, but certainly not heavy. The field of view is 341 feet at 1,000 yards, and the minimum close focus is 9.8 feet. The eyecups are the twist-and-lock variety with three intermediate clicks between the fully up and fully down positions. The binoculars come with a three-piece strap—with a neoprene segment to go around your neck connected on each side to a nylon strap that connects to the binocular body. The rain guard for the eyepieces is made of hard plastic with an adjustment screw in the middle to make it fit no matter how close or wide the interpupillary distance is set. I don’t happen to like this kind of rain guard. I much prefer a simple hard rubber, one-size-fits-all arrangement so I don’t have to fiddle around with the little screw every time the interpupillary distance gets changed. But it’s a minor complaint. All in all, these are excellent binoculars that I would be happy to take birding anyplace anytime.